KZen is about to release ZenGo, a mobile app to manage your cryptocurrencies securely and more easily. There are already countless crypto wallets out there, but the startup thinks they’re all either too complicated or too insecure. If you own cryptocurrencies, chances are they’re sitting on an exchange, such as Coinbase or Binance. If somebody manages to log in to your account, nothing is stopping them from sending those assets to other wallets and stealing everything. Worse, if somebody hacks an exchange, they could potentially divert cryptocurrencies from that exchange’s wallets. In other words, leaving your cryptocurrencies on an exchange means you give your assets to that exchange and hope they properly take care of them. On the other end of the spectrum, you can manage your private keys yourself and rely on a hardware wallet from Ledger and Trezor. The learning curve is too hard for many people. And if you don’t follow instructions properly, you might end up losing access to your wallet or accidentally sharing private keys. Enough about other wallets, let’s talk about ZenGo. 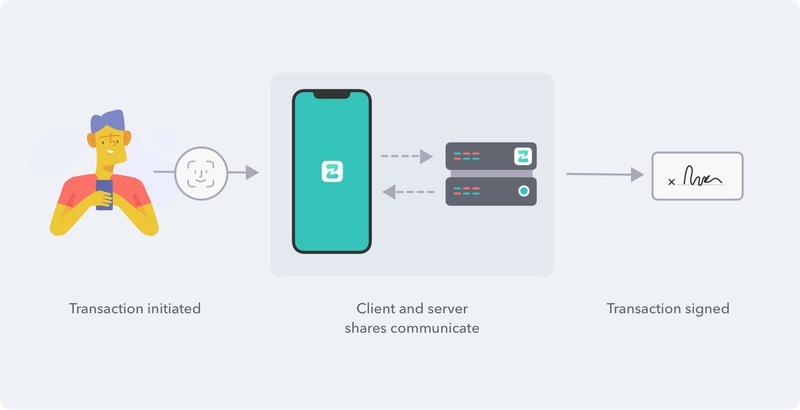 Former TechCrunch editor Ouriel Ohayon and his team think the perfect wallet app involves a smartphone you own paired with ZenGo’s servers. 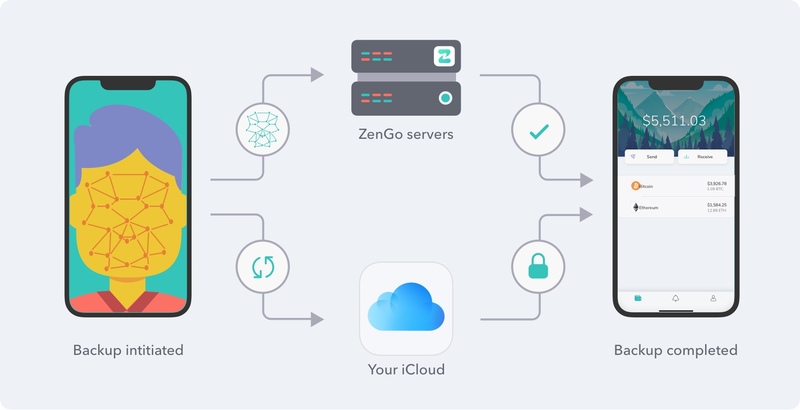 The company uses threshold signatures, which means that you need both ZenGo’s servers and your smartphone to initiate a transaction. If you lose your device, you can recover your funds. But the startup can’t access your cryptocurrencies on its own. Behind the scene, ZenGo still uses a public key and private secrets, but everything is completely transparent for the end user. When you set up your wallet, two private secrets are generated separately and stored in multiple ways — one part is on your smartphone, the other is on the servers. You need both parts to sign a transaction. If you back up your device part to ZenGo’s servers, you can recover all parts in case you lose your device, for instance. ZenGo can’t directly access the second part on its own because it is encrypted using a decryption code that is stored on your iCloud account. But accessing your iCloud is not enough — if you want to recover your wallet, you need to prove your identity. That’s why the company stores a 3D biometric face map to let you restore your wallet on a new device. The company partners with ZoOm so that you can create a face map from any smartphone with a selfie camera. The security model has been open-sourced and I hope many security experts will try to find vulnerabilities. That’s the only way you can know for sure that it’s a secure system. All of this sounds complicated, but most users won’t even realize what’s happening. I tried the app and it’s a well-designed mobile app. Right now, it only supports Bitcoin and Ethereum, but more assets are on the way. The company tracks your public addresses to notify you when you receive funds. The app isn’t available just yet. It should launch as a beta this week and arrive in the stores pretty soon. Samsung has invested nearly $3 million in French crypto hardware wallet maker Ledger. A new software release from Lightning Labs targets a risk for users: the chance they'll lose funds if their hardware is having problems. You can now convert coins to bitcoin at more than 2,000 Coinstar kiosks in 19 different states. Mike McMahon, chief technology officer at crypto merchant bank Galaxy Digital, has left the firm, CoinDesk has learned. The privacy-oriented Brave browser is launching today its long-anticipated product where web users are compensated for their attention. TrustToken has launched a stablecoin backed by the Australian dollar, with tokens for CAD, HKD and euros to follow soon. The agency that regulates and manages China's foreign exchange reserves will trial a blockchain system addressing inefficiencies in cross-border trade. Blockchain compliance startup Chainalysis has added support for Binance’s native token BNB and three stablecoins to its transaction monitoring tool. A case involving millions of dollars in bitcoin and Western Union payments resulted in New York State's first conviction for crypto money laundering. Bitcoin could be in for a price pullback, as litecoin, which led the crypto markets higher earlier in the year, is now showing signs of weakness. Bitfury and Swiss investment firm Final Frontier have launched a bitcoin mining fund after it was authorized by an EU regulator. Samsung is reportedly developing an ethereum-based blockchain network and is eyeing the eventual issuance of a "Samsung Coin" token. Ethereum's domain registration service is gearing up for major changes, including faster registration, tradeable domains and an annual fee. Russian opposition leader Alexei Navalny has attracted $3 million in bitcoin donations over the last three years. French investment bank Societe Generale has issued $112 million of bonds as a security token on the public ethereum blockchain. Lightning Labs has put out an alpha release for its lightning desktop app for bitcoin's mainnet. A security consultancy found that an unknown person or group has been undertaking a sophisticated scheme to steal ether from weakly-protected addresses. 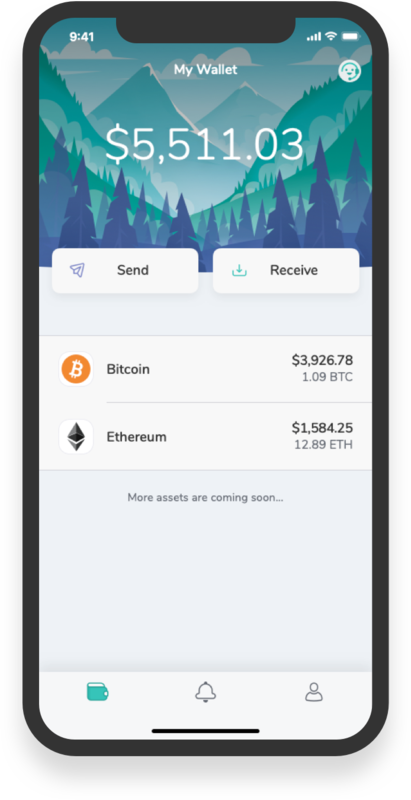 BlockFi has gathered another $18 million of bitcoin and ether deposits since last month, bringing its total interest-earning accounts to $53 million. Coinbase is shutting down the Chicago trading technology office it opened a year ago, eliminating 30 jobs. Crypto exchanges Huobi Japan and Fisco were investigated by the country’s Financial Services Agency last week, according to Reuters sources. Get $10 Worth for FREE Bitcoin! Most Trusted name in Crypto! Copyright © 2019 BITCOIN NEWZZ. All Rights Reserved. The Magazine Basic Theme by bavotasan.com.